As I am exploring SSIS 2012, one of the features which I have used in SSIS is the data viewer functionality. It is one of the ways to find out what data is passing through the data flow task. It gives an idea about the data that is being extracted from source before being committed into the destination table. This feature is useful to get an idea about the data like profiling the data that is being sourced. 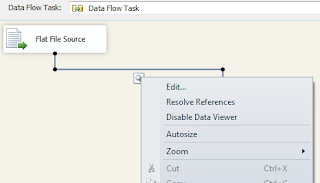 In SSIS 2008, in order to enable the data viewer, within the data flow task one had to right click on the flow connecting the source and destination, choose the Data viewers option and then choose Add from the Data flow path editor. In SSIS 2012 enabling data viewer has been made simpler. 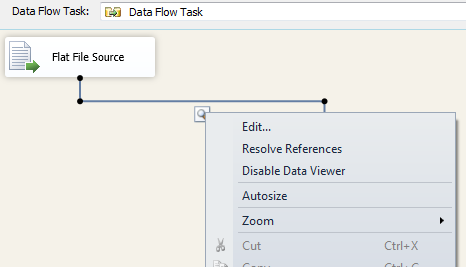 In the data flow task, right click on the path connecting the source and destination, then click on the Enable Data viewer option as illustrated below. Once that is done, click the Edit option to edit the columns that need to displayed in the data viewer. In case the data viewer is not added one can disable the option by following the image shown below. Choose the Disable Data viewer option. In Summary in this blog post I wanted to show case the data viewer option in SSIS 2012. Yea, that would be great if it worked! That is, following the steps above in SSIS for SQL Server 2012 (using VS2010) and then running the package it does not seem to work in that it does not pop-up the data view results window. I also tried forcing the window to popup by disabling then re-enabling the Data View during debugging which forces the results window to pop-up but still no results in the data view results window. I am certain that there are results so the behaviour is unexpected. Any thoughts would be appreicated on how to solve this issue! Thanks for your comments. I tried it with my sample package and the enable data viewr worked as expected with the results in the data viewer. I would try rebuilding the package and preview the data at source and make sure the package/source is is reading the data.